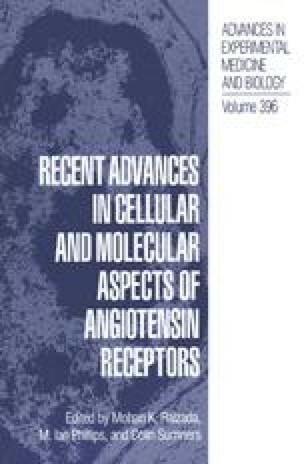 Angiotensin II receptors present in cardiomyocytes, nonmyocytes (predominantly fibroblasts), nerve terminals, and the heart vasculature mediate the multiple actions of angiotensin II (AII) in the heart, including modulation of normal and patho-physiological cardiac growth. Although the cellular processes that couple AII receptors (principally the AT1 subtype) to effector responses are not completely understood, recent studies have identified an array of signal transduction pathways activated by AII in cardiac cells. These include: the stimulation of phospholipase C which results in the activation of protein kinase C and the release of calcium from intracellular stores; an enhancement of phosphaditic acid formation; the coupling to soluble tyrosine kinase phosphorylation events; the initiation of the mitogen activated protein kinase (MAPK) cascade; and the induction of the STAT (Signal Transducers and Activators of Transcription) signaling pathway. It is tempting to speculate that these latter responses, which have been previously associated with growth factor signaling pathways, are involved in AII-induced cardiac growth. Interestingly, some of these novel pathways are apparently not under the same strict control imposed upon the more classical signaling pathways. Thus, while AII-induced calcium transients are rapidly (within minutes) desensitized following exposure to AII, the MAP kinase pathway is not, and activation of the STAT pathway requires hours of agonist exposure for maximal induction. These observations support an emerging picture in which the downstream signal transduction pathways of AII receptors are initiated and terminated with a distinct temporal arrangement. This organization allows appropriate rapid responses (e.g. vascular contraction) to transient AII exposure, some of which are rapidly terminated, perhaps for protective reasons, and others not. In contrast, additional responses (e.g. growth) probably require prolonged exposure to agonist.